Sixers guard Markelle Fultz drives to the basket in this file photo. 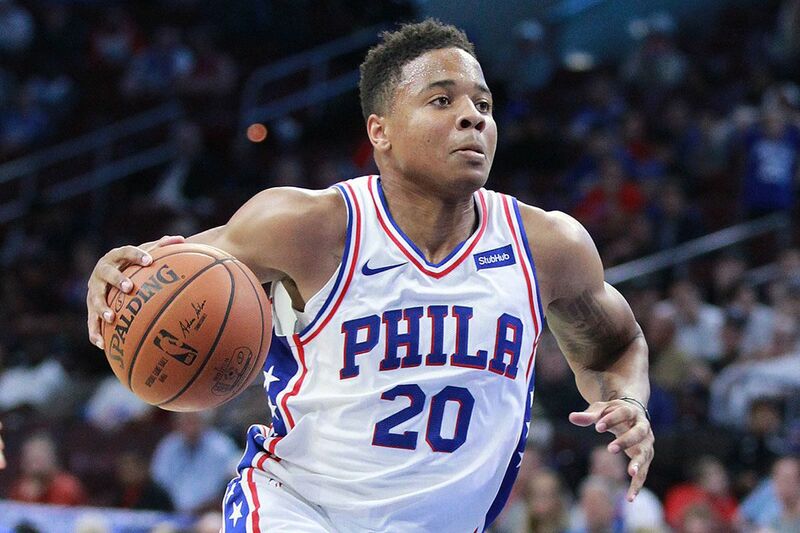 Markelle Fultz played full contact 5-on-5 during Sixers practice Sunday in Camden. Though still not considered a full-practice participant because of some small restrictions, Fultz looked good in his full contact play said coach Brett Brown. Markelle Fultz played full-contact five-on-five basketball during Sixers practice Sunday in Camden. Though he is still not considered a full-practice participant because of some small restrictions, head coach Brett Brown said Fultz looked good in his full-contact play. "He didn't go through the full practice today, but he went through the large majority of it," Brown said. "I thought he looked good for not having done much in the past few months." The update is the most significant since the No. 1 overall pick was shut down Oct. 25 because of a scapular muscle imbalance in his right shoulder. The Sixers are still not willing to put a timetable on Fultz's return, but his progression and participation have been accelerating. Tuesday he was taking part in only half-court four-on-four drills, so playing five-on-five is a sign that not much is left standing in the way. Brown has continued to say that the team will not rush Fultz's return, and that after getting the all-clear from the medical staff Brown still wants Fultz's shot back to normal and improved. "We understand the responsibility to grow him and help him navigate a very unusual start to an NBA season," Brown said. Fultz will accompany the team when it heads to London Monday night ahead of Thursday's game against the Celtics at The O2 Arena. Brown said that he didn't know if Fultz would be available to play against the Celtics but that he didn't expect it. The Sixers' 7-foot-2 center did not practice Sunday. Brown said that Embiid had some soreness in his back but that there was no indication it was anything more than a rest-and- recuperation day. "He was part of everything team-wise in relation to video sessions and discussions," Brown added. The five days between the Sixers' last game and the game Thursday in London will no doubt be good for Embiid, who is also rehabbing a sprained right hand. The Sixers signed James Young to a two-way contract Friday and the former Kentucky standout couldn't be happier. "It feels amazing," Young said. "I'm blessed to have this opportunity." Young said that his agent called him after a game one night and told him that Elton Brand, the Delaware 87ers general manager, wanted to watch him play because the Sixers were looking to sign him to a two-way deal. As a two-way player, Young will split him time between the Sevens and Sixers. Because of the signing date he can spend up to 25 days with the Sixers, not including any time after the Sevens season ends.